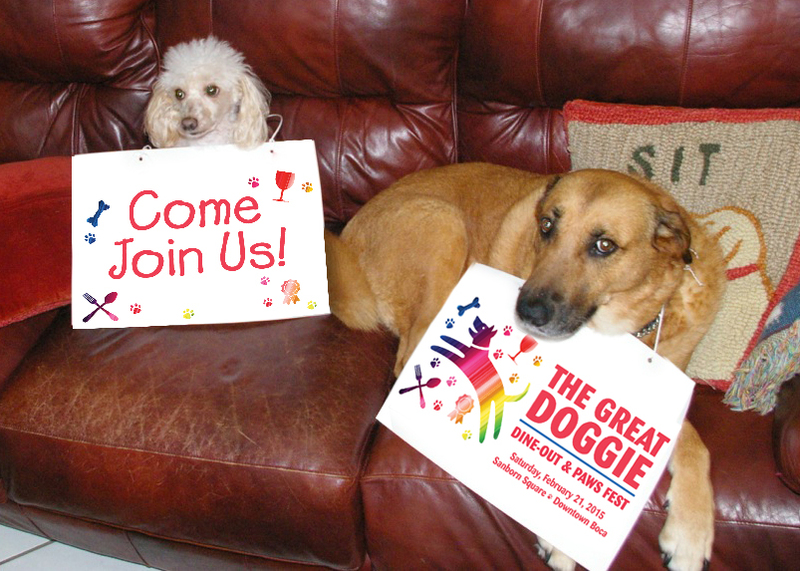 Capping off ‘Love Your Dog Week’, will be a paws-packed schedule of free, open-to-the public ‘fur and fun’ at the inaugural The Great Doggie Dine-Out & Paws Fest (GDD&PF) held to support Tri-County Animal Rescue’s (TCAR) Medical Care Fund, Saturday, February 21st at Sanborn Square in Downtown Boca at 72 North Federal Highway. Held from noon to 9 p.m., themed activities for all generations of pet lovers and their furry friends include opening ceremonies with a pups parade of rescue alumni and their families followed by a ‘yoga with dogs’ session, Young Pet Set activities and games, Yappy Hour ‘Singles’ Mingles and a ‘Tails & Tales’ Dog Showcase with a Smooch The Pooch kissing booth featuring TCAR’s current adoptables. The event culminates with an afternoon Fur-Baby Couture Fashion Show at 4 p.m. followed by live entertainment and an after-dusk ‘big screen’ movie-in-the-park heartwarming feature film presentation at 7 p.m. of DreamWorks Pictures and Nickelodeon Movies: Hotel for Dogs. There will also be curbside dining by Gourmet Truck Expo, ‘Dogs for Dogs’ hotdog bar and specialty cocktails and pet treat exhibitors; pet-centric exhibitors from Noon to 5 p.m., a DJ and live entertainment for plenty of ‘dancing with dogs’. Entries in the inaugural Great Pet Bed Design Competition –which is currently open to designers, artists, businesses, schools, children and anyone else ‘who wants to channel their pet passion’ — will be on display with awards announced at 3:30 pm. Promoting ‘all things TCAR’ — the region’s largest 501c (3) 100% NO KILL animal rescue and adoption nonprofit organization — there will be a ‘Pups & Peeps’ Park, ‘Love Our Pets’ puppy and dog care tips and training sessions and demonstrations, a meet-the-author-and-rescuers and book-signing for the new recently released “Rescuers Who Rescue” pictorial keepsake book. The younger set will have the opportunity to show both their ‘love and talent’ as they participate in painting The Great Community Paws Mural that will be later displayed at the entrance of the TCAR campus on Boca Rio Road (to be visible from the Florida Turnpike) and enjoy animal book storytelling sessions by local officials and community leaders. There will also be a ‘know your breeds’ scavenger hunt, pet-themed arts and crafts, and registration for TCAR Youth Ambassador program. Event co-chairs Bonnie and Jon Kaye of Kaye Communications, TCAR’s official PR and marketing firm, conceived the festivities and gathered a dedicated event committee representing a cross-section of the community to promote the features, advantages and benefits of TCAR as “Boca’s ‘Own’ Humane Society” rescue and pet adoption center. Event-goers will learn more about TCAR’s safe haven for dogs and cats, the nonprofit’s life-saving mission and large scale rescue successes, community services, ‘adopt not shop’ initiative. TCAR receives no local, state or federal government funding for operations, medical treatment and housing. The inaugural event is produced by Kaye Communications Marketing & PR, supported by sponsors including Sklar Furnishings, Elad National Properties, Essentia, Capitol Lighting, and Rotary Club Downtown Boca Raton. Event partners include Downtown Boca, Palm Beach Outdoor Cinema Events, Gourmet Truck Expo, Potions in Motion, DJ Roberto Patroni, MatMatterz, G girl Productions, LivingFLA.com, singer-songwriter and recording artist Kendra Erika, Waterstone Resort & Marina and more. For more information on The Great Doggie Dine-Out & Paws Fest and related programming and sponsorship, partnership, exhibitor and volunteer opportunities visit Facebook: Great Doggie Dine-Out & Paws Fest or contact Jon Kaye (jkaye@kcompr.com) or Victoria Jones (vjones@kcompr.com) at Kaye Communications 561-392-5166. Saving lives in Palm Beach, Broward, Miami-Dade and Martin counties and beyond, TCAR’ — the region’s largest 501c (3) 100% NO KILL animal rescue and adoption nonprofit organization — has been a protective haven to thousands of abandoned, abused or neglected dogs and cats from high-kill facilities and large scale puppy mill rescue mission collaborations in South Florida, Treasure Coast and as far as Sarasota, Alabama, Tennessee, Oklahoma, Louisiana, the Bahamas and most recently abroad from Istanbul, Turkey. A top-rated animal rescue center not limited to regional borders for large scale rescue efforts, TCAR has rescued more than 52,000+ animals since its inception in 1996, offering homeless pets a welcoming forever home, either on campus or through carefully vetted adoptions. Located at 21287 Boca Rio Road, Boca Raton, Florida 33433, TCAR is open for adoptions five-days-a-week Tuesdays, Thursdays, Fridays, Saturdays and Sundays from 10:30 a.m. to 4:00 p.m. For frequent updates or more information on TCAR, visit tricountyanimalrescue.com; connect via facebook.com/TriCountyHumane, twitter.com/TriCountyAR and Instagram/TRICOUNTYANIMALRESCUEFL.